I now have two vegie patches. They are 12 metres long and 1.5 metres wide and they are flourishing. This year I have been a little wiser with my planting. I am scarred for life after last year’s effort. I had never seen so many tomatoes and cucumbers in my life. I still remember the day I picked 28 cucumbers and the days I picked tomatoes by the bucket loads, not in cute little bowls. I do not think we will get through the preserved tomatoes and cucumber relish by the end of 2014. I think it will be 2016 before I will need to preserve any more. Instead of being inundated with tomatoes and cucumbers I have decided to branch out to give us a bit more variety. This IS true, though I do have an alarming amount of little green tomatoes on my bushes and I have already made cucumber sandwich pickles and I did picked 4 cucumbers yesterday and we did have the tomato and sage tart for dinner last night. Still, life is much more manageable this year. Corn is my new highlight crop. But, as with all vegetables it is ripening all at once. Today I picked 8 cobs. Because we have been eating corn and corn fritters pretty solidly for a fortnight now I decided it was time for a little preserving. Corn relish it was. 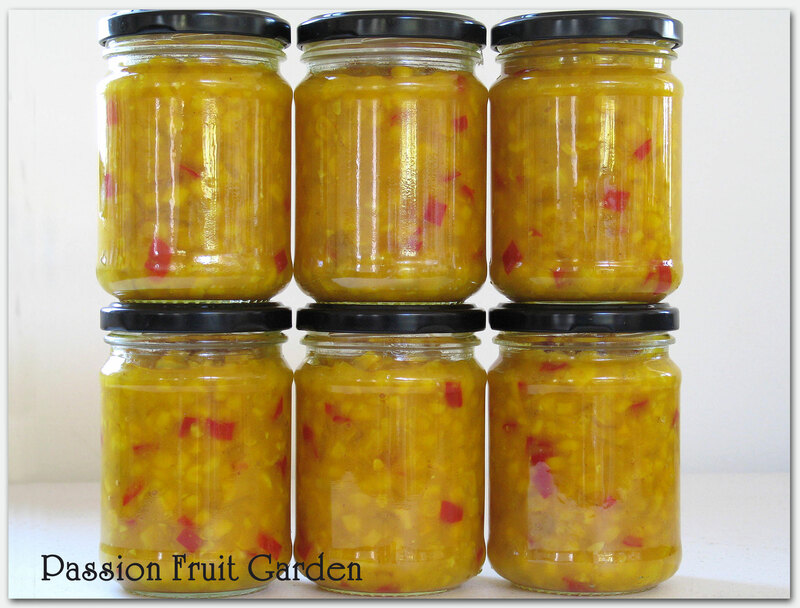 I am very fond of corn relish but haven’t had any for years as I don’t buy commercial chutneys and relishes and I haven’t grown any corn, which means, given my philosophy on life, no corn relish. This recipe comes from A Year in a Bottle by Sally Wise, a book I highly recommend. Put the the corn, capsicum, chilli and onion in a large bowl. Add the salt, mix well and leave for, at least, two hours. Place the sugar, vinegar, mustard and turmeric in a large saucepan. Bring to the boil. Add the vegetables and bring back to the boil. Cook over a medium heat for 25 to 30 minutes. Mix the cornflour (Clearjel) into a paste with the extra vinegar. Slow add the cornflour mixture to the relish in a steady stream, stirring all the while. Boil for an additional 3 minutes. Spoon into sterilised jars and seal. Refrigerate after opening. Sally advises the relish is best left for two weeks before using. She also advises a 200 to 250g jar of this relish mixed with 250g of cream cheese makes an excellent dip. I think I might try that. These quantities made 6 x 200 mil jars. 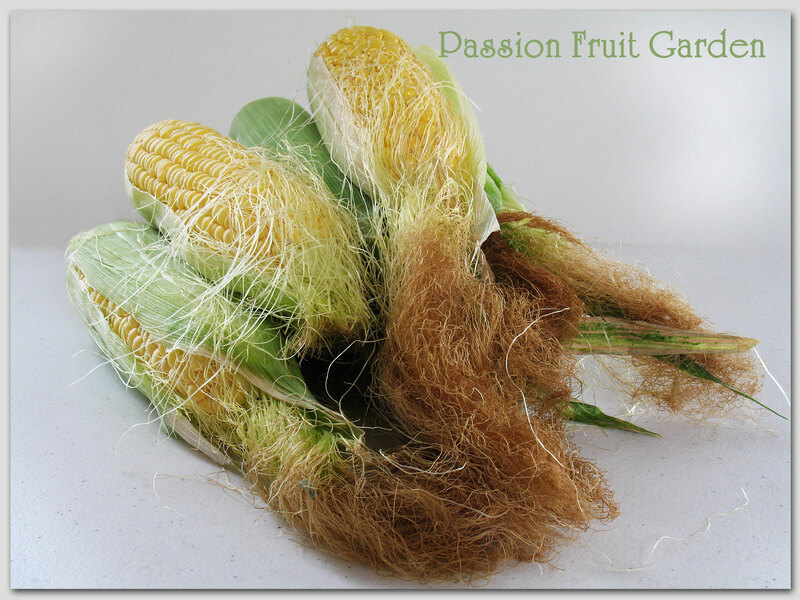 This entry was posted in Corn, Homemade Produce, Pickles & Relishes, Preserving the bounty and tagged Preserving corn, What to do with excess corn? by Glenda. Bookmark the permalink. You just have such a green thumb and sound like my mother who I swear could make rocks grow. I’ve never attempted to grow corn but I know when my mother did that she used to soak the seeds before planting. (See how much I know about gardening? I have vague memories of some things and think…well I could do that…nah, maybe not). Hi Diane I love growing things, it is so satisfying making dinner with ingredients you have grown yourself. You should try it. I do a few things – tomato plants, some squash…but usually my energy is at it’s peek in late spring and I fade fast. I’ve got some medical issues that keep me from doing so many things that I love doing so I try for very low maintenance things or herbs and flowers. My dear Grandmother used to grow corn many many years ago and it was just beautiful. I remember staying with her as a child and having it for breakfast, lunch & dinner. Well it seemed like that. Anyway it has always stuck in my mind how delicious & fresh they were. It was a very fond memory not just about the corn but my dear Nan. I was just thinking what you could use corn relish for. Great idea mixing it with cream cheese for a dip. Scrumptious. You clearly have green fingers Glenda with such a successful garden. Hi Mandy, Thankyou so much. Corn relish is usually eaten with ham. It is very nice. Hi Celia, We can’t have chickens as we can’t look after them whilst we are going between the two places and we can’t decide whether we are city girls or country girls. Hi Liz It sure is. Maus just read your meatloaf recipe, she is keen to try it. I will let you know.